VersaDock has just completed another successful installation of a Drive on Dock for a private owner, tailoring the design detail to accommodate a brand new White Shark 226cc open sports boat. Delighted that his motorboat can now be so easily berthed high and dry out of the water, the owner benefits from the bespoke specification that VersaDock provided to fit both the hull shape and weight of the White Shark 226cc, which at 1180kg plus engine, is well within the robust three ton limit of VersaDock’s Static Drive on Dock, the model chosen for this berthing solution. 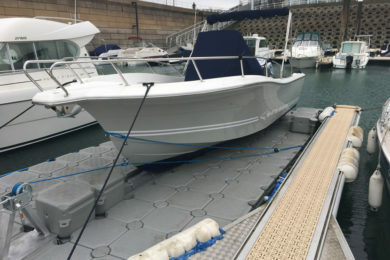 Once the specification of the dock was established to suit the boat, its modular construction meant that the build was quick and simple, and the dock was delivered to the owner’s home port of Queen Elizabeth Marina in Jersey ready for the coming season. VersaDock’s team also gave the owner a training session in driving the boat on and off the dock, which, although quick and simple to grasp, is all part of the service. The military grade materials and advanced technology of the VersaDock Static Drive on Dock is especially designed to keep the stern of the boat with its additional engine weight equally as clear of the water as the rest of the platform, meaning it is stable and safe, and sets it head and shoulders above the competition.